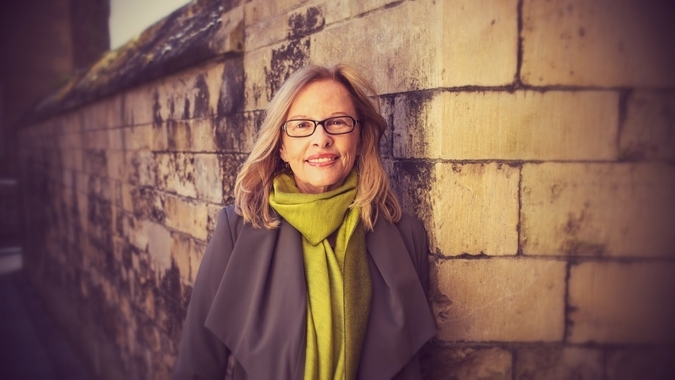 Anita Shreve is hands down my favourite fiction author. Many years ago an ex-boyfriend's mom gave me one of her books for Christmas knowing that I enjoyed reading. I remember thinking at the time how odd it would be to gift me that book when I'd never read that author before or mentioned wanting to, but I'm so glad she did. I can confidently and consistently pick up any of her books and enjoy it. 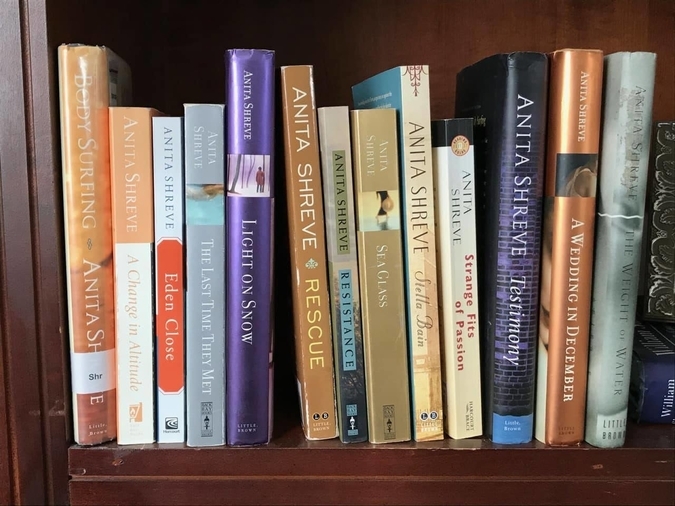 Shreve is also a go-to recommendation for me when friends or family ask for a book they should read next as I think she appeals to a wide variety of female readers, whether you read a lot or not. The random Christmas gift makes all kinds of sense to me now that I've read through ~half of her repertoire. She writes fiction that centers around hard relationships, but the stories are never predictable, cheesy, or formulaic. If you understand my distinction between fluffy fiction and serious fiction, I would argue Shreve writes serious fiction. She has a way with syntax and word choice that accurately describes emotions and relationships in a way that I didn't know words could capture. You will recognize yourself or people you know in the situations she writes about. I haven't read all of her books. I typically buy any new titles I haven't read of hers at used book stores, but I don't seek them out to buy new. I'm going to discuss them all chronologically and share my thoughts on the ones I've read. I will say that although I love her work, she has a substantial amount of historical pieces that I'm not sure I'll ever read, purely because I hate that genre. But never say never I suppose. Eden Close (1989) --- I haven't read this book yet but it's sitting on my shelf at home. I had no idea actually that it was her first book until just now so I'm inspired to read it as one of my next few books. The storyline follows a man returning to his hometown for his mother's funeral and re-building a relationship with his female neighbour who went through a tragedy when they were young. Strange Fits of Passion (1991) --- This is definitely one of my favourite of all her books that I've read so far. It was more suspenseful and mysterious than her usual stories and I read the whole thing in like, one shift at my old job on a golf course. The story is about a woman fleeing an abusive relationship and starting over again in a secluded location where she meets a new love interest. It's basically Nicholas Sparks' Safe Haven but way, way better and significantly less cheesy. The story flashes back and forth between the woman's current life and her life with her previous abusive husband. I've recommended this book a bunch, and one time I lent it out and the person's dog ate it. I've since replaced it because I feel like I need to always own a copy. Where or When (1993) --- I haven't read this book and I don't own a copy yet so it's one to look out for in the book stores. The story looks right up my alley, as it's about two ex-lovers who begin writing intimate letters to each other thirty years after their initial romance. Both characters are married and with families (this is essentially my worst nightmare). 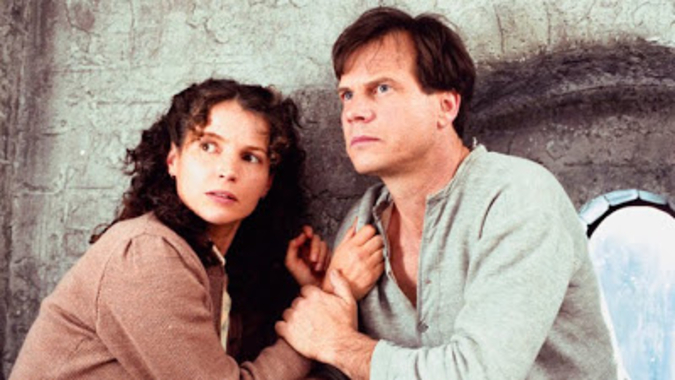 Resistance (1995) --- I haven't read this book either and to be honest, this is probably one of her least appealing novels to me as I hate period pieces. It's about the wife of a resistance worker in Nazi Germany who falls in love with a wounded American pilot while harbouring him. I just found out this book was adapted into a film starring Bill Paxton and Julia Ormond. I will likely never read this book or watch the movie, but it's good to know she had some novels adapted as I had zero idea. The Weight of Water (1997) --- This book is amazing but there is a horrific twist of events that had me actually feeling ill for a time after reading it. A photographer and her family take a boat trip out to a monument she's been researching amidst her own marital problems and there are all kinds of troubles. Shreve does a really good job in this book of describing the issues in the marriage without having the characters actually spend too much time discussing them. Subtle things like the way they sleep next to each other, and how they interact around their daughter give the stress away. These details take her writing to another level in my opinion. This novel AGAIN I JUST LEARNED was adapted into a film starring Sean Penn, Elizabeth Hurley and Sarah Polley. This I will watch... this weekend if not tonight. Let's hope it doesn't ruin the book for me. Fortune's Rocks (1999) --- I haven't read this one either and it's another period piece so I'm not entirely sure whether I will or not. What I do love is that it's set on the American East Coast (one of my favourite book locations- is this wierd?) and that it's about the affair between a high class young lady and an older man. The Last Time They Met (2001) --- I read and loved this one. You can read my full review here. I didn't enjoy the story right off the bat but by the end it was one of my favourite plotlines of any of her books. It has a great twist that makes you re-think the entire story in a new light. It's about a woman and a man who fall in love in their teens and then re-connect at two different periods in their lives. The book takes you through these periods in reverse sequence which is a bit hard to follow but entirely worth it for the point Shreve is trying to make. I really love stories that take place over a long period of time, but I know a lot of people don't. This wouldn't be top of my list for recommendations only because it is slow at first, but if you can commit to finishing it I think it's fantastic. There's also an amazing breakdown scene in this book as well if you're twisted like me. All He Ever Wanted (2001) --- This is another period piece that I haven't read, and it's about an oppressive marriage as told through the eyes of the oppressive husband, which is even less up my alley than period pieces... The couple meets when the man saves the wife from a burning building (so she already has Stockholm Syndrome) and then they pursue a romantic relationship and marriage which is, according to the synopsis, bad. Sea Glass (2002) --- I haven't read this book either but it's top of my list as it's about a young couple who gets married and buys a house right before the economy crashes. They then have to make all sorts of terrifying financial decisions together, something about relationships that is SO fascinating to me. Body Surfing (2003) --- I did read this one but it didn't stay with me for very long... not one of my absolute favourites of hers. The book is about a divorcee and widow who tutors for a rich family one summer and ends up in a romantic triangle with both of the family's sons. It was definitely still amazing by all writing standards, but in terms of Shreve's repertoire specifically, it wouldn't be my first recommendation. Light on Snow (2004) --- I think this is definitely one of Shreve's saddest books. The story is told retrospectively by one of the characters as she reflects on her childhood when her and her single dad found a baby in the snow on their property. Despite being one of my favourite topics, I have a very hard time reading about the anxiety of parenting. I think if you had your own kids this book would be especially devastating. A Wedding in December (2005) --- The plot line of this book is very similar to that of a movie I love called The Romantics (2010)- which is also a book but I haven't read it. A bunch of old classmates come together for one of the couples' weddings and all of their incestuous history comes to the forefront. There's part of me that hates these stories because I can't relate at all. I never had a core co-ed group of friends that have stayed in touch really... but part of me also really loves these stories because I find these types of friend groups fascinating. I'm almost weirdly jealous of them in a way. If you enjoy reading about romance and/or complex friendships this book is especially great. Testimony (2008) --- I remember when I was reading this book feeling like it couldn't possibly be Shreve's work. The writing style was the same but the subject matter of this book is wildly different from anything she's done that I've read. The story is about a group of boys at a private school who are accused of sexual assault, and how their lives individually fall apart based on these accusations. I think this is an amazing read, especially in today's climate. This book switches between 3-4 different perspectives as well, and includes the students, the teachers and the parents which I really like. There are some great themes that come up in this, not only sexual assault and victim sympathy, but also parenting and rich privilege (not sure if this is a real term or something I just made up). While this is unlike most of her other work, I really loved it and I highly recommend it to anyone interested in these topics. A Change in Altitude (2009) --- I recommended this book in our post on books to get you excited for an adventure as it's very expedition based. The story is about American newlyweds who move to Kenya for the husband to do some medical work. The wife, a journalist, struggles to find an identity for herself there. The couple joins up with some other local couples and take up hiking as a hobby. On one of the hikes there is a major tragedy, and the combination of guilt and blame eats away at the newlyweds as a couple, and at their friendships with the others. The incident is actually shocking and I remember clearly calling Meg to discuss it with her. In a way, I wish it happened in real life so I had more reason to talk about it. If I was going to re-read one of her books it would likely be this one. Rescue (2010) --- This was the first book I ever read of Shreve's (gifted to me by my ex-boyfriend's mom) and it had me instantly obsessed with her writing. The plot to this story is not typically my favourite. Man and woman fall into a tumultuous love affair and have a baby, mom abandons family, 18 years later daughter is spiraling recklessly, mom re-appears in family's life, family adjusts to new dynamics. It's pretty cliche. However, Shreve's writing is soooooooo good and I wish everyone would read this book first like I did to get hooked as well. Stella Bain (2013) --- I have this book sitting on my shelf unread also, although being another period piece, I'm not entirely sure how high on the list it is. It's set in WW1 and is about an American woman who is injured and taken in by a British surgeon and his wife. Again, not really my thing but there is obviously is a large demographic who likes these types of stories. The Stars are Fire (2017) --- This is Shreve's newest book and potentially something on my Christmas list. The story is set in 1947 and follows two women and their children as their homes face wildfires and their husbands join a group of volunteers to go help fight them. I feel like although this is historical fiction, I will maybe enjoy it since a) it's set on the American East Coast and b) my absolute favourite plot to anything is a wife at home who doesn't know the fate of her husband. If anyone has read any of the same ones I have, I am literally dying to discuss them with you... I have yet to meet another human who has read more than one of her books which I find absolutely baffling. If you love fiction and you are looking for a new author with a ton of material to sink your teeth into, Shreve is my first recommendation. If you've ever talked to me I've likely already recommended her to you.